Hurricane Harvey Forecast To Become A Major Hurricane! Hurricane Harvey Updates As Of 6 PM MDT Thursday, August 24, 2017. Infrared (IR) Satellite Image Of Hurricane Harvey. 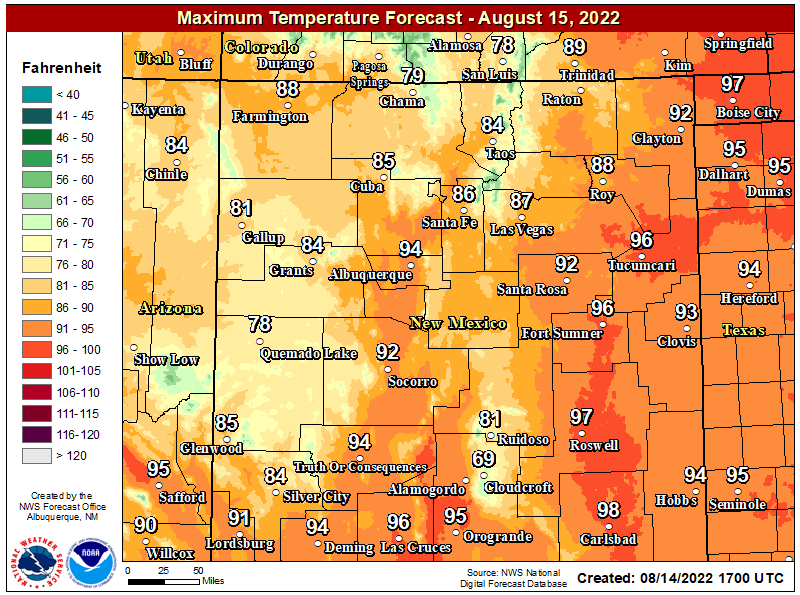 Valid At 6:12 PM MDT Thursday, August 24, 2017. 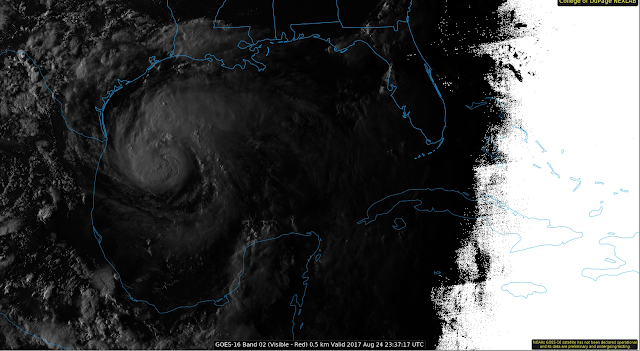 GOES-16 Visible Satellite Image Of Hurricane Harvey. 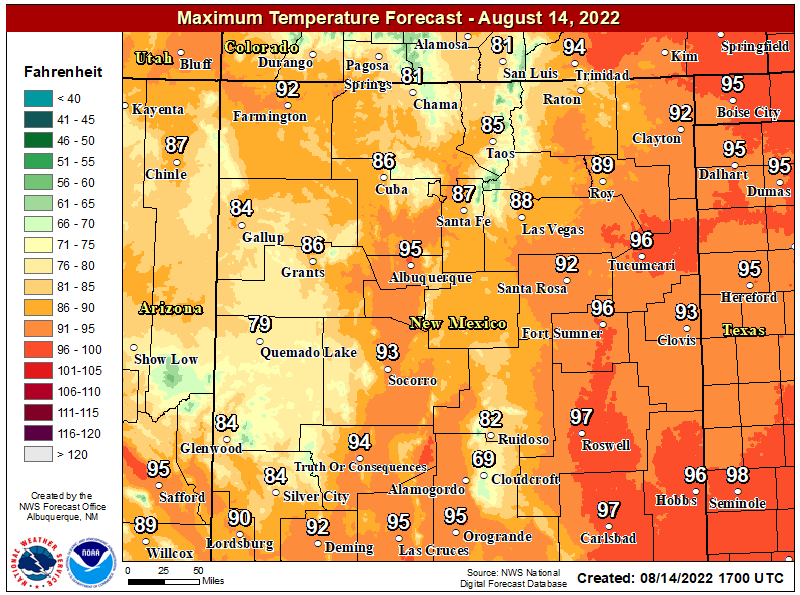 Valid At 5:37 PM MDT Thursday, August 24, 2017. 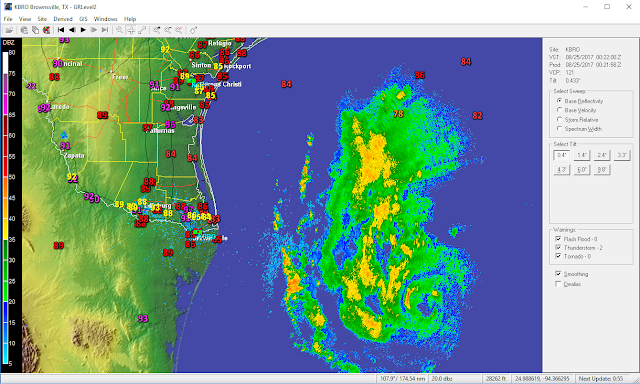 GRLevel2 Radar Image Of Hurricane Harvey. 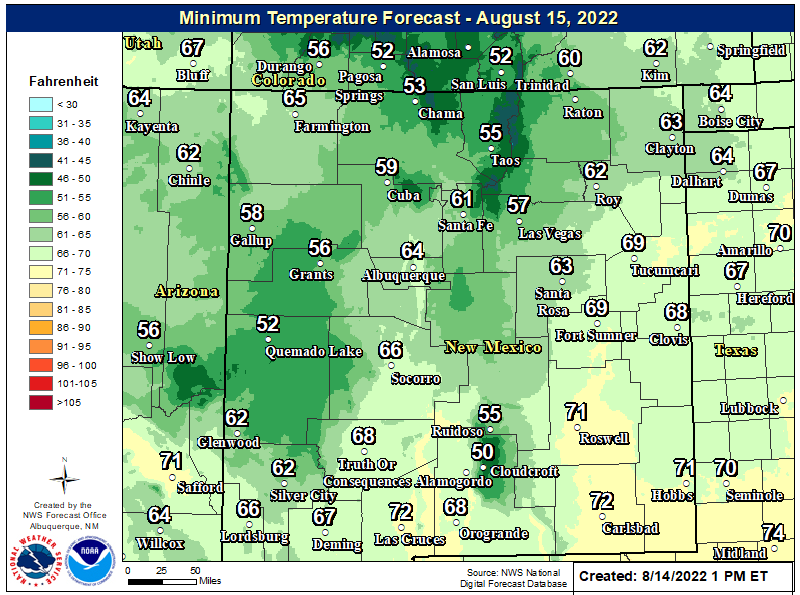 Valid At 6:22 PM MDT Thursday, August 24, 2017. 6 PM MDT Update From The National Hurricane Center. 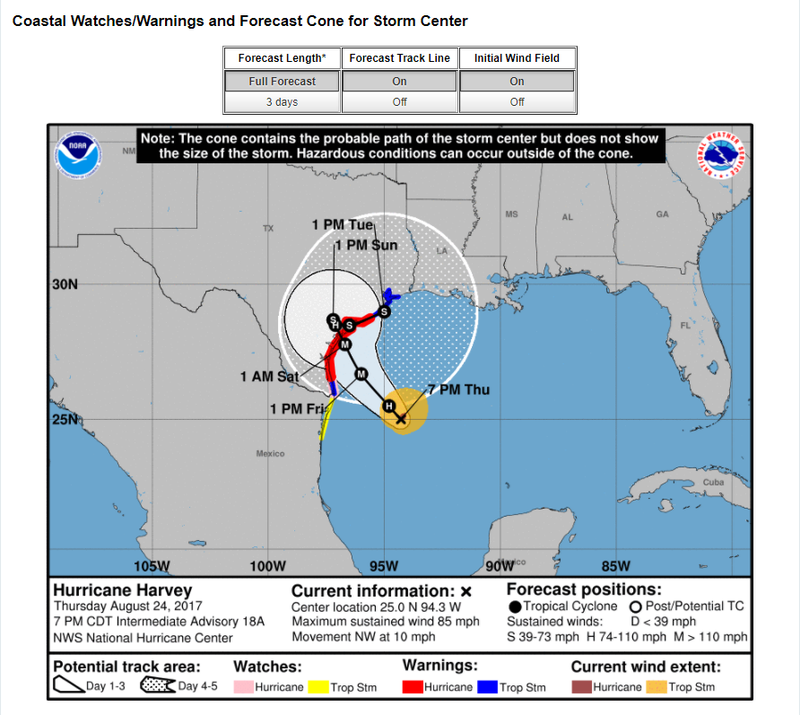 At 6 PM MDT Hurricane Harvey was located near Latitude 25.0 N and Longitude 94.3 W or 275 miles southeast of Corpus Christi, Texas. Harvey is moving to the northwest at 10 mph and is forecast to slow down in its forward speed over the next couple of days. Of major concern is the possibility of the Hurricane strengthening to a Major Hurricane with sustained winds of at least 111 to 129 mph (Category 3 on the Saffir-Simpson Wind Scale) and then stalling a little ways inland after it makes landfall near the Corpus Christi area. Harvey has sustained winds of 85 mph with gusts near 100 mph. Current indications are that Harvey may become a Major Hurricane (Category 3) by around noontime MDT on Friday. Harvey's central pressure is down to 974 millibars or 28.76 inches of mercury. Currently Hurricane Harvey is forecast to make landfall north of Corpus Christi, Texas in the Matagorda Bay area just east of Rockport and Lamar sometime between sunset and midnight CDT Friday night. HOWEVER THIS MAY BE SUBJECT TO CHANGE! The exact track and forward speed in Harvey's forecasts are not set in stone and any deviation of such may have major implications for persons living along the Texas Gulf Coast. If Harvey moves inland further south (especially south of Corpus Christi) than is currently forecast then Corpus Christi will be in greater danger of bearing the strongest winds of the Hurricane in its northeastern and eastern quadrants. Should this happen then the storm surge in Corpus Christi would be worse than is currently forecast. 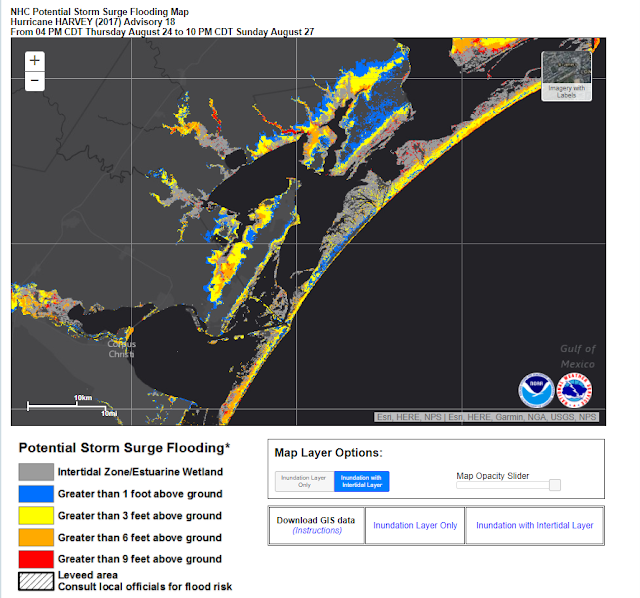 Interactive Storm Surge Flooding Forecasts. 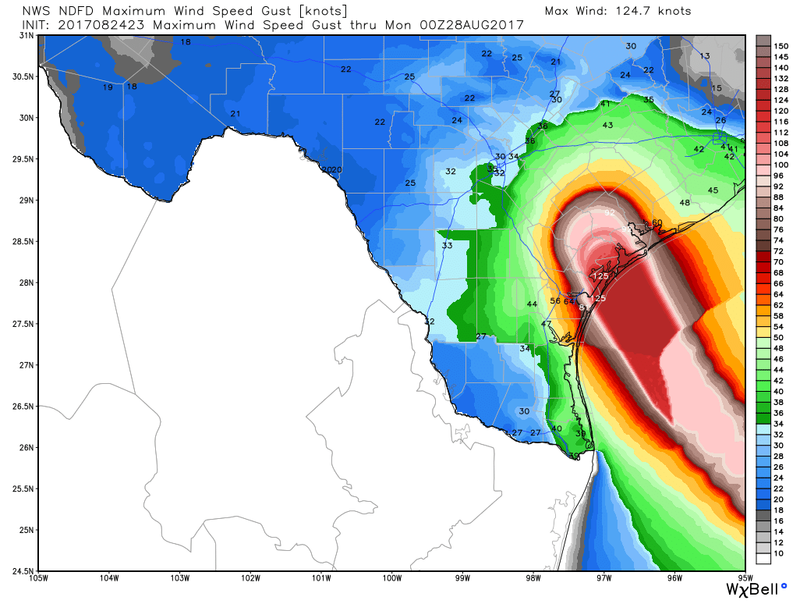 NWS NDFD Hurricane Harvey's Sustained Wind Forecast. Note that the National Weather Service is forecasting peak wind gusts of 125 knots or 144 mph. This is subject to change if Harvey strengthens more than currently is forecast. 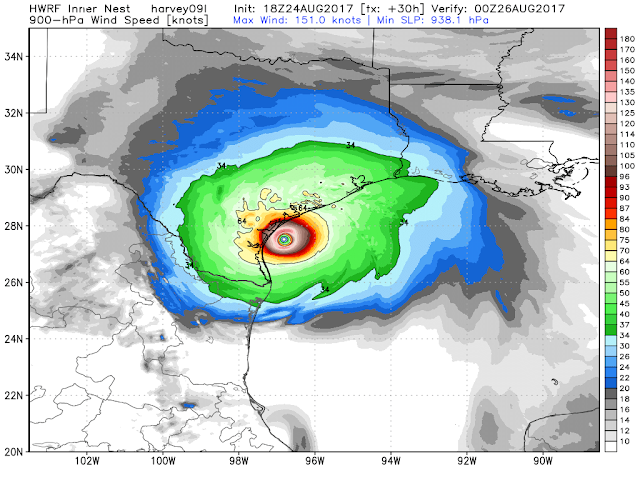 Today's Noon MDT run of the HWRF forecast model has sustained winds in Harvey of 151 knots or 174 mph and a central pressure of 938 millibars or 27.70 inches of mercury. There are legitimate concerns that Harvey may rapidly intensify into a Major Hurricane tonight into Friday before he makes landfall. Should Harvey attain this strength and plow inland with 150 mph sustained winds with gusts to 175-200 mph then catastrophic damages would occur! This would be from these extreme winds and the horrendous storm surge flooding that would ensue. 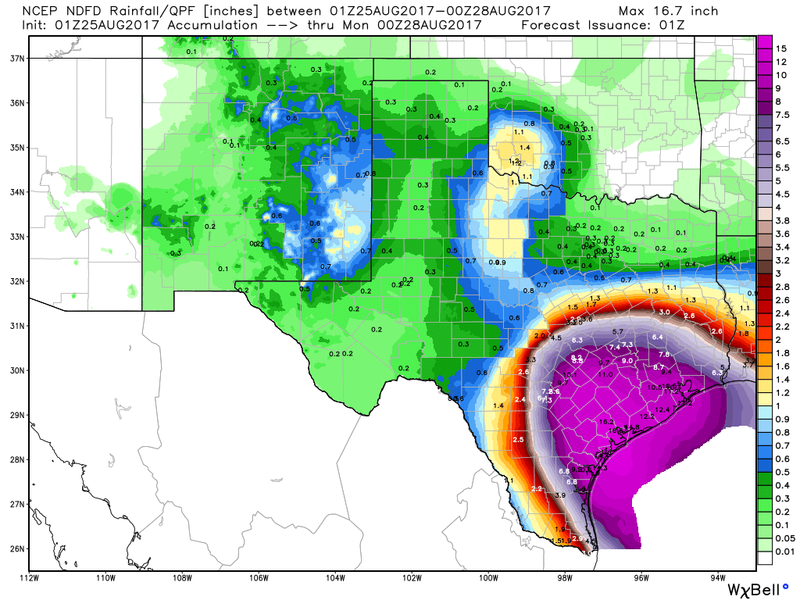 Catastrophic Flooding Possible From Harvey's Rains. Valid At 6 PM MDT Sunday, August 27, 2017. 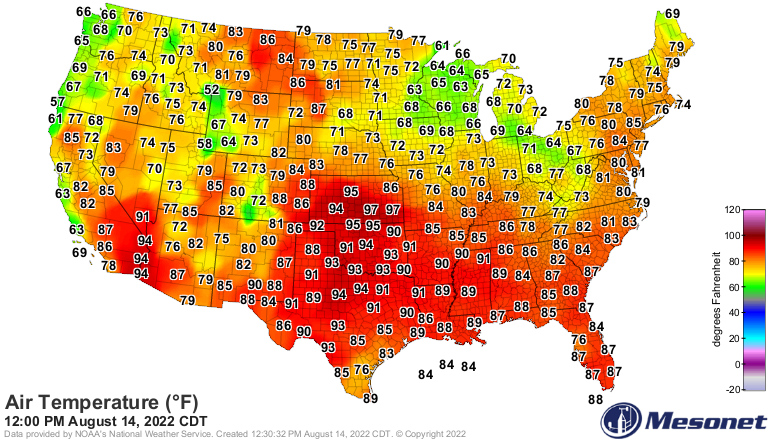 Today's 18Z/Noon MDT GFS Storm Total Forecast. Valid At Thursday, August 31, 2017. 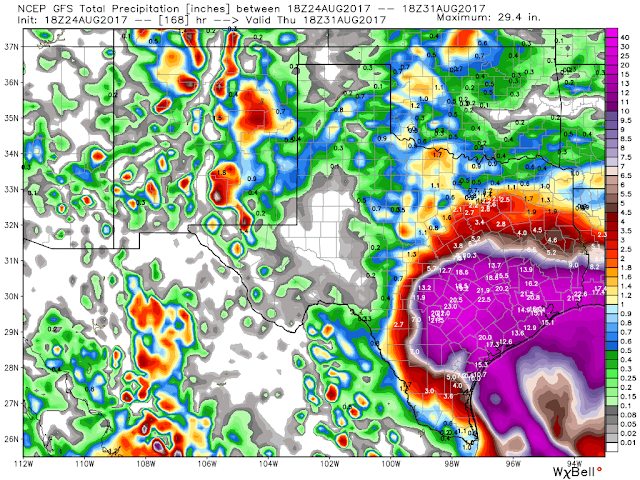 Current National Hurricane Center Forecasts (6 PM MDT Advisory Thursday) call for Hurricane Harvey to produce rainfall totals of 15" to 25" with maximum amounts of 35" by next Wednesday over south Texas! This also is subject to change depending upon how strong Harvey becomes and where he makes landfall, and then tracks afterwards. Ca strophic flooding and flash flooding will be possible from Harvey's rains and may very well being as big of a news maker as the damage from his winds and storm surge! Corpus Christi, Texas National Weather Service Office. Galveston, Texas National Weather Service Office. Brownsville, Texas National Weather Service Office. San Antonio, Texas National Weather Service Office. 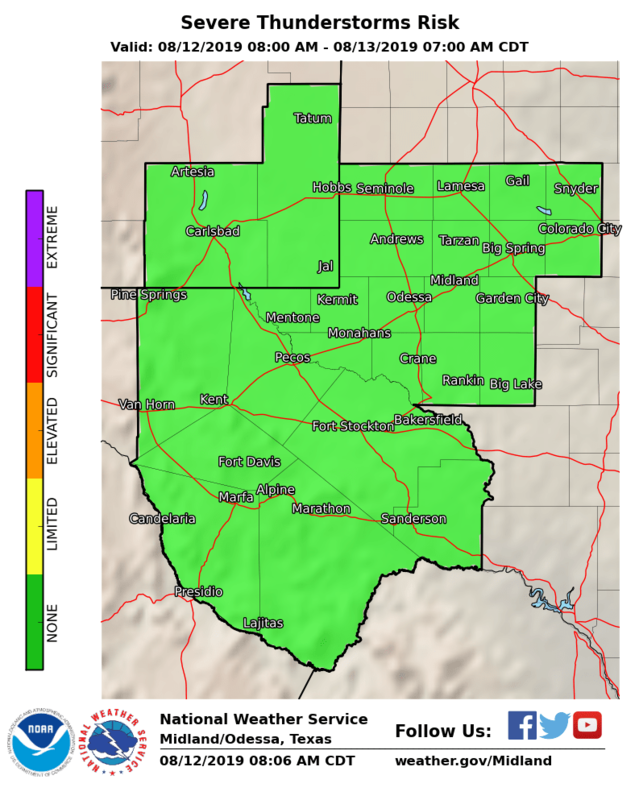 People along the Texas Coastal Bend and nearby areas are strongly urged to keep abreast of all of your forecasts, watches and warnings via this link. Harvey will be the strongest Hurricane to threaten the Corpus Christi, Texas area since Hurricane Celia made landfall near Corpus Christi on August 3, 1970. 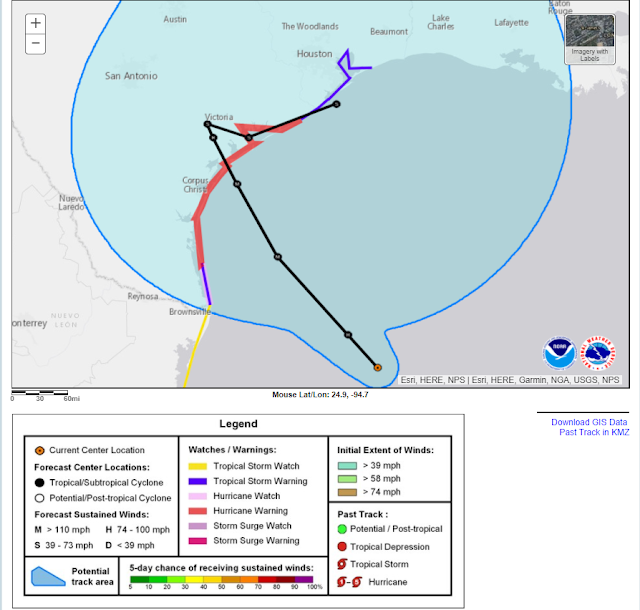 Hurricane Celia was the costliest tropical cyclone in Texas history until Hurricane Alicia in 1983. The third named storm, second hurricane, and first major hurricane of the 1970 Atlantic hurricane season, Celia developed from a tropical wave in the western Caribbean Sea on July 31. Initially, the depression tracked north-northwestward without significantly strengthening, and crossed over western Cuba on August 1. Heavy rains on the island caused severe flooding, leading to five fatalities. The depression entered the Gulf of Mexico and was upgraded to Tropical Storm Celia later on August 1. Due to warm sea surface temperatures, Celia rapidly intensified into a Category 3 hurricane on the Saffir–Simpson hurricane wind scale on August 1. Storm surge and swells lashed the west coast of Florida, especially the Panhandle, causing eight people to drown. Early on August 2, Celia began to weaken. However, the storm underwent rapid deepening again and peaked as a Category 3 hurricane with winds of 125 mph (205 km/h) on August 3. In Louisiana, tides caused minor coastal flooding. Minor erosion damage was reported along Highway 82 in Cameron Parish. Late on August 3, Celia made landfall near Corpus Christi, Texas. Throughout the state, 8,950 homes were destroyed and damaged about 55,650 others. About 252 small businesses, 331 boats, and 310 farm buildings were either damaged or destroyed. Impact was the worst in Nueces County, which observed gusts as high as 180 mph (290 km/h). In Corpus Christi, about one-third of houses suffered severe damage or were destroyed. Additionally, about 90% of the buildings in downtown were damaged to some degree. Celia weakened as it continued further inland and dissipated over New Mexico on August 6. The remnants of Celia brought up to 2 inches (51 mm) of rainfall to the state. Overall, this storm caused 28 deaths and $930 million (1970 USD) in damage. A tropical wave emerged into the Atlantic Ocean from the west coast of Africa in late July; a weather station in Dakar, Senegal observed a wind shift on July 23. The system moved quickly across the Atlantic at 20 and 25 mph (32 and 40 km/h) and reached the Lesser Antilles by July 28. The wave then continued moving rapidly westward across the Caribbean Sea. 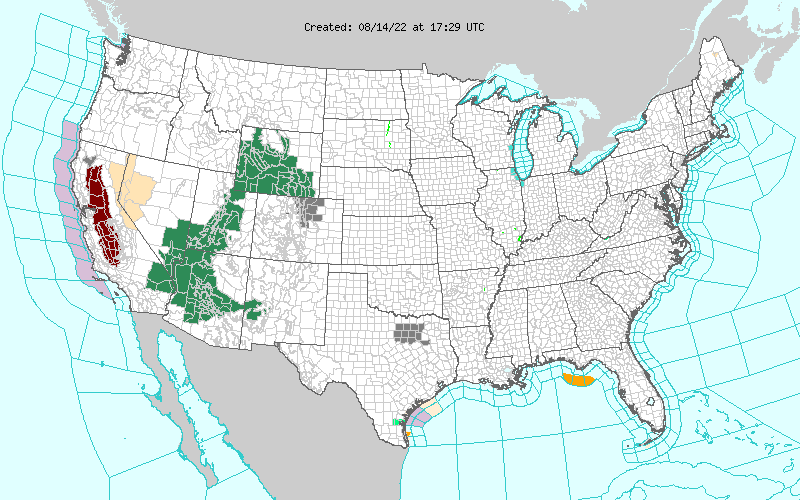 However, falling atmospheric pressures over the Southern United States eroded a subtropical ridge, causing the system to decelerate by July 30. Around that time, a closed circulation began to organize in the northwestern Caribbean between the Cayman Islands and Swan Island. At 0000 UTC on July 31, a tropical depression developed about 90 mi (145 km) west-southwest of Grand Cayman. The depression strengthened while heading north-northwestward, though a reconnaissance aircraft could not complete its mission on July 31 due to the depression's proximity to Cuba. Early on August 1, the depression made landfall in western Pinar del Río Province, Cuba. A weather station in Cape San Antonio recorded a minimum barometric pressure of 1,007 mbar (29.7 inHg). After reaching the southeastern Gulf of Mexico on August 1, warm sea surface temperatures caused the depression to undergo rapid deepening. Later that day, the depression reached tropical storm intensity and was named "Celia", based on a reconnaissance flight observing tropical storm force winds. Satellite imagery indicated that Celia was becoming significantly more organized. At 0000 UTC on August 2, reconnaissance aircraft data indicated that Celia suddenly strengthened into a Category 3 hurricane with sustained winds of 115 mph (185 km/h). However, the storm weakened to a Category 2 hurricane about six hours later. Due to Celia's steady west-northwestward motion across the Gulf of Mexico, the National Hurricane Center marked that the storm "aimed at the Corpus Christi area like a wild beast stalking its prey." 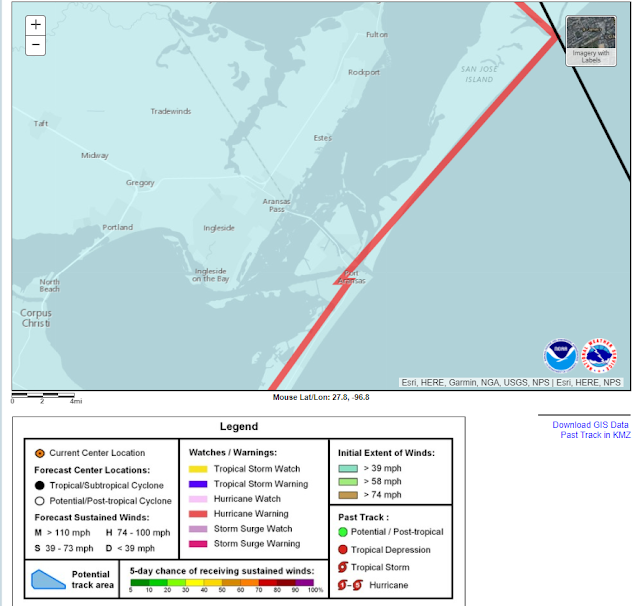 Early on August 3, it weakened further to a Category 1 hurricane. Unexpectedly, Celia underwent rapid deepening once again while nearing the coast of Texas later on August 3, including a 39 mbar (1.2 inHg) decrease in pressure in only 15 hours. At 1800 UTC on August 3, Celia attained its peak intensity with maximum sustained winds of 125 mph (205 km/h) and a minimum barometric pressure of 945 mbar (27.9 inHg). 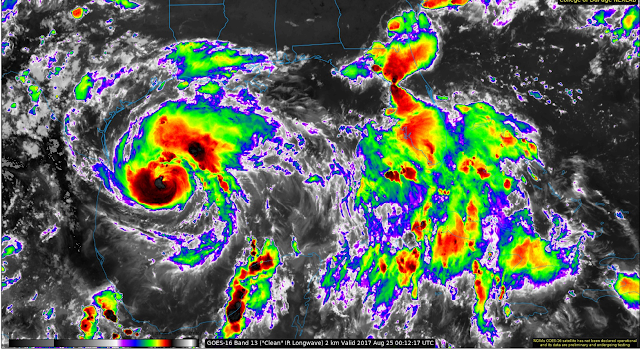 Shortly thereafter, the storm made landfall near Corpus Christi, Texas at the same intensity. Celia "maintained strength for an unusually long time" after moving inland,weakening to a tropical storm at 0600 UTC on August 4. Early on the following day, the storm further weakened to a tropical depression. 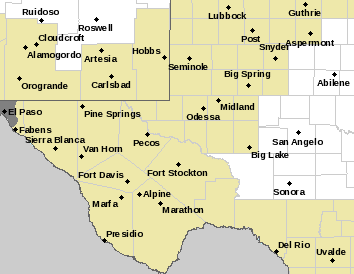 Celia dissipated over western Texas at 1800 UTC on August 5, though the remnants persisted until reaching New Mexico. The most severe damage was in Corpus Christi and Aransas Pass. Throughout the state, 8,950 homes were destroyed and damaged about 55,650 others. About 252 small businesses, 331 boats, and 310 farm buildings were either damaged or destroyed. Initially, losses were estimated to have reached $434 million. However, due to lower insurance rate of coverage, the original insured losses, $310 million, were tripled, rather than doubled. Thus, the damage toll was revised upward to $930 million in 2011. Damage to crops was slightly more than $8.8 million. In addition, Celia caused 15 fatalities and injured 466 others. The most severe damage occurred in the streaks of damage, not by tornadoes, but a series microbursts and downbursts, most of which occurred in a 15 minute span. Survivors of the storm described the downbursts as suddenly "rocket shells" exploding. However, areas between the streaks suffered surprisingly little damage, mainly ornamental due to debris from the homes nearby. Celia dropped heavy rains as it made landfall. 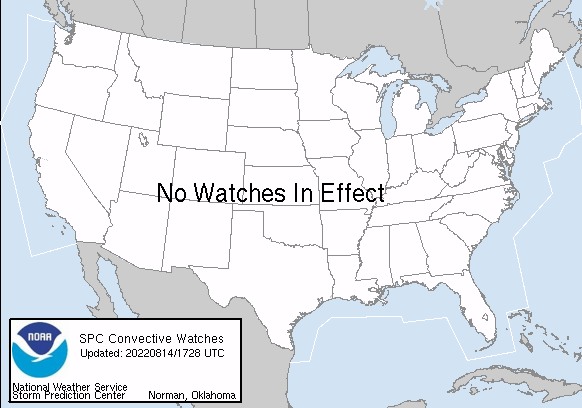 However, due to the small size and fast movement of the storm, precipitation was not widespread. At the time of landfall, much of Texas was suffering from a drought. Most areas received 3 to 4 in (76 to 102 mm). In Alvin, a small tornado caused the destruction of a few fences and moved a pickup truck. Downed trees caused slight property damage in Amistad Dam, a municipality in Val Verde County. 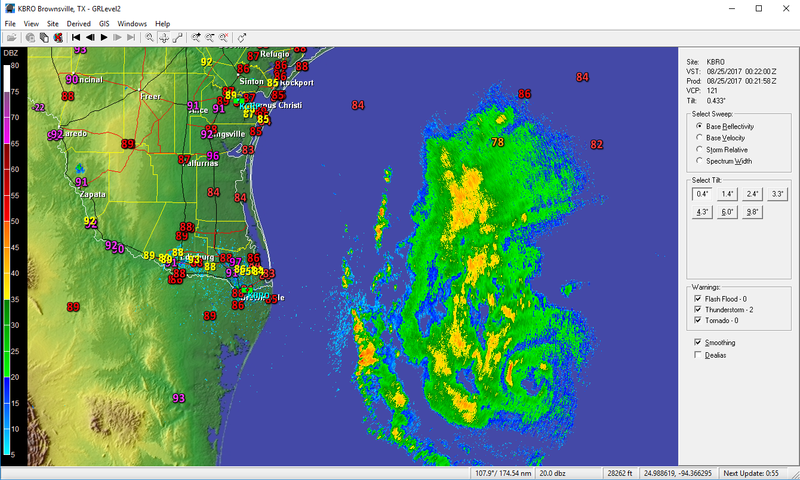 Gusts between 170 and 180 mph (270 and 290 km/h) were reported within the Aransas County portion of Aransas Pass. In Artesia Wells, minimal damage occurred to property, reaching only $5,000. The storm damage some homes and 15% of crops in Austwell.Losses in that section of the city reached an estimated $20 million. Minor damage was inflicted on weak structures and shingle or metal roofs in Crystal City. Impact on trees and crops were minimal. Thus, the reported wind speeds of 85–90 mph (137–145 km/h) were considered "doubtful". Property damage in Del Rio was about $1 million, with wind impacts mostly to roofs, mobile homes, signs, boats, windows, trees, and homes under construction, while some businesses and homes were flooded. In Frio County, a tornado spawned in the Dilley area toppled utility poles, destroyed several chicken houses, and blew the roof of a house 600 to 900 feet (180 to 270 m) away. In addition, two farm houses were deroofed and several outhouses were damaged. Another tornado spawned nearby caused "considerable" damage to the Dilley Civic Center, destroyed machine sheds, unroofed outbuildings, and felled many electrical poles. Throughout Dilley, there was $250,000 in property damage and $350,000 in crop losses. An estimated $50,000 was inflected to property in Eagle Pass. 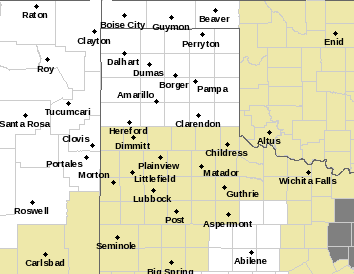 Strong winds in George West caused damage to 90% of trees, some houses, and cotton crops. Damage estimates in the city range from $250,000-$500,000. In Gregory, property losses was about $1 million, while there was about $25,000 in damage to crops. Near Lake Corpus Christi, a man died after he was struck by debris from his house, which was hit by a tornado. Two other people were injured by that tornado and several homes were destroyed. The storm spawned at least 2 other tornadoes, those neither caused any known damage. Damage in Langtry was very minor, reaching only $600. A tornado in Port O'Connor, destroyed a 30 by 230 feet (9.1 by 70.1 m) boat storage shed, which was owned by Cooperative Weather Observed Bill H. Young. In Refugio, a rancher observed wind gusts up to 142 mph (229 km/h). About $707,500 in damage occurred to property, while crop losses reached $425,000. One injury was reported after a person was struck by flying glass. 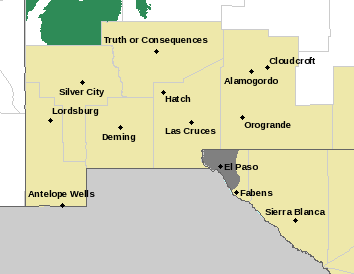 Wind gusts up to 160 mph (260 km/h) in Sandia damaged every house, 90% of cotton crops, and caused 1 fatality. Although wind gusts of 168 mph (270 km/h) were observed in Taft, only $5 million in property and $500,000 in crop damages were reported. In Tilden, the storm brought maximum sustained winds up to 100 mph (160 km/h). As a result, the entire city lost telephone and electrical services and there was "lots of damage" to trees, 80% of houses, and roofs. Property damage reached about $3.4 million, while there was also $25,000 in crop losses. Property losses in Uvalde reached $100,000, while damage to crops was estimated at $250,000. Additionally, a tornado was spawned in Yoakum, though it apparently caused negligible impact. The highest tides produced by the storm lashed Nueces County. Tides were 9.2 feet (2.8 m) and 9 feet (2.7 m) mean sea level at Port Aransas Beach and the Port Aransas Jetty, respectively. The heaviest rainfall totals observed from the storm also fell in Nueces County, with 7.26 inches (184 mm) of precipitation reported in Robstown. Because rainfall was relatively light, minor, if any flood damage occurred. Strong winds were reported, with winds gusts measured as high as 161 mph (259 km/h) and 180 mph (290 km/h) at the Corpus Christi Weather Bureau Office and Aransas Pass, respectively. Further inland, wind gusts were estimated to have reached 180 mph (290 km/h) at Robstown High School, as the oil derricks on the property, built to withstand with of 175 mph (282 km/h), were knocked down. Due to high winds, 85% of the total property damage caused by the storm occurred in Corpus Christi, with 90% of the buildings in downtown either damaged or destroyed. About a third of the houses in the city had serious damage or were destroyed. The University of Corpus Christi, a private institution located on Ward Island, suffered so much damage that it could not afford to rebuild, and was sold to the State in 1973. Just northeast of the Corpus Christi International Airport, several hundreds of mobile homes were ripped into small fragments, and the remains were scattered for hundreds of yards. Facilities owned by the Southwestern Bell Corporation (which later became AT&T) suffered $10 million in losses. Another telephone company in the area, General Telephone Company, estimated $700,000 in damage occurred to its business. At the United States Army helicopter repair center in Corpus Christi, there was about $5 million in damage. Around 800–900 family housing units at the Naval Air Station Corpus Christi were considered uninhabitable, indicating $35 million in losses at that location. Two large Sunoco oil tanks and another owned by Humble Oil burned after possibly being struck by lightning. Approximately $17 million in losses occurred to both companies. Heavy property damage was also reported in rural areas, totaling to slightly more than $20 million. At least 75% of buildings in Port Aransas were damaged. Overall, 74% of property losses associated with Celia was in Nueces County. While crossing the Gulf of Mexico, Celia produced tides 1 to 2 feet (0.30 to 0.61 m) above normal on the southwestern coast of Louisiana. As a result, slight erosion of Louisiana Highway 82 occurred in Cameron Parish between Johnson Bayou and Holly Beach. No damage or fatalities were reported in that state. 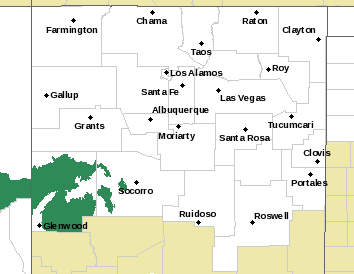 After dissipating, the remnants of Celia produced up to 2 inches (51 mm) of rain in New Mexico, though no other impacts in the state are known. Following the storm, then-President of the United States Richard Nixon declared seven counties in Texas as disaster areas – Aransas, Bee, Jim Wells, Live Oak, Nueces, Refugio, and San Patricio – allowing affected residents to be eligible for federal relief.Immediately, then-Governor of Texas Preston Smith sent National Guardsmen to the area to patrol and assist with recovery. About a week after the storm, Governor Smith stated that the most urgent need was financial assistance, and designated the American Red Cross as the official relief agency. The American Red Cross chapters in Colbert and Lauderdale counties in Alabama announced that they were accepting donations to send to southern Texas. In Corpus Christi, officials applied to pollution control officers for permission to burn 1,300,000 cubic yards (990,000 m3) of debris. The University of Corpus Christi (UCC) suffered so much damage that repairs were not affordable. In May 1971, the Texas Legislature passed a bill to establish a Texas A&I campus in Corpus Christi. By two years later, after local residents raised approximately $1.8 million to support the school, the UCC transferred its properties to Texas A&I University. In addition, most homeowners insurance policies refused to write insurance for areas considered to be "high risk" along the Texas coast, prompting the state government to form the Texas Catastrophe Property Insurance Association, now known as the Texas Windstorm Insurance Association. 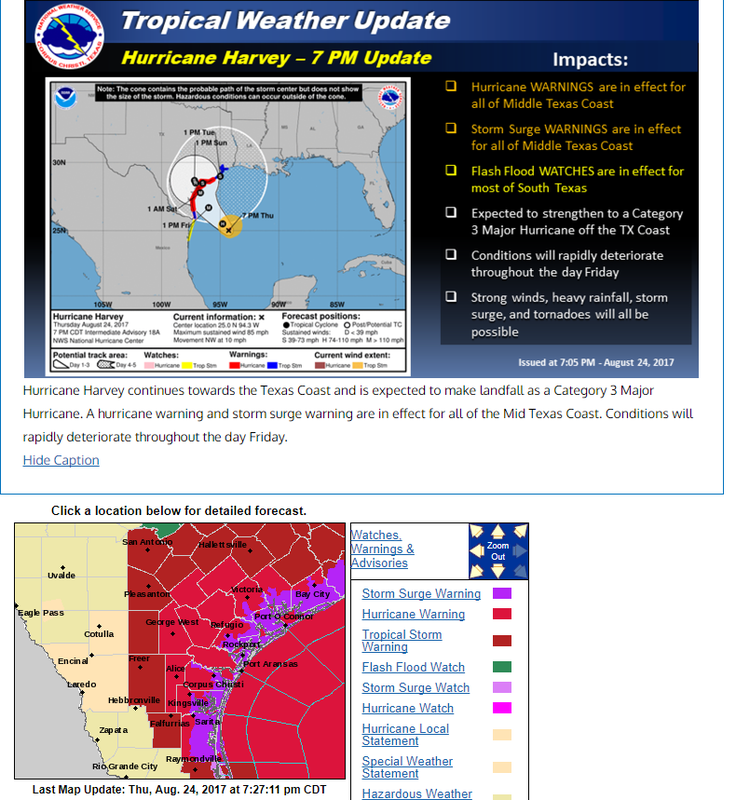 Today, TWIA offers coverage to the 14 coastal counties of Texas and a small portion of Harris County near Houston, Texas.